Which Social Media Scheduling Tool Should You Use? You always need to be on social media. Well, not always. Depending on the network, I can skip a day and not lose any followers. I try to post something on Facebook every day but nothing happens if I miss a day. Instagram is like not that. I skip a day and lose like 6 followers. Can be tough. Social media can take up a good chunk of your time. Schedulers help...a lot. It's good if Twitter is your only social network. I like how you can have different columns to monitor lists and hashtags. I use lists to keep track of certain accounts. I monitor hashtags to see what people are talking about. Having columns for these things in one place makes it easier to find content to retweet. They're how I find out what my target audience likes. The free version of TweetDeck doesn't limit on how many columns you can create. Between TweetDeck and a mobile device, you don' have to spend much time on Twitter. I wanted one place where I could manage all my social networks, not just Twitter. With the free version, I connected two Twitter accounts and my Facebook page. Unlike TweetDeck, Hoostuite limits the number of columns you can have in each tab. In addition, the free version limits the amount of tabs you can create. It was difficult keeping track of lists and hashtags. I decided to pay for HootSuite so I can connect all my social networks. I manage Facebook, Pinterest, LinkedIn, MailChimp, Flickr, Twitter and Instagram. Before LinkedIn changed its policy, I monitored my groups from HootSuite. It makes life so much easier. It also has analytics but I don't really use them. No reason for it. I've gotten into the habit of going to the social network for analytics. Let's say you find an article online that you want to schedule, Hootsuite also has a browser extension that lets you do so quickly. To schedule tweets. With HootSuite's browser extension, I need to upload an image from my desktop. As you probably know, content with images get better reach and engagement than those without. With HootSuite, I'd have to save the image to my desktop then upload into the scheduler. I was fine with that until I discovered that Buffer will pull images from the article for you. Meaning, I don't have to go through the extra step of saving the images on my computer! Saves so much time and hard drive space. Now, I'm using Buffer instead of Hootsuite to schedule tweets. I like how I can easily Re-Buffer (re-schedule) tweets. I don't think I'll make the switch completely to Buffer. It doesn't look like the scheduler allows you to connect more than one account from the same social network. You're only allowed one Twitter, for instance. I run 3 accounts-not all are mine. 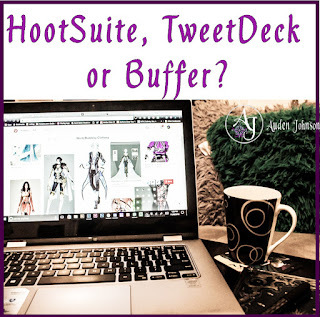 Buffer doesn't let you create columns like in Hootsuite or TweetDeck. I need my columns. To schedule things on Pinterest. This app caused my engagement on Pinterst to shoot up. I love Tailwind. It's a separate tool but I can manage it in Hootsuite. Like Hootsuite, it has a browser extension. What social scheduler is better? Depends on what you want. 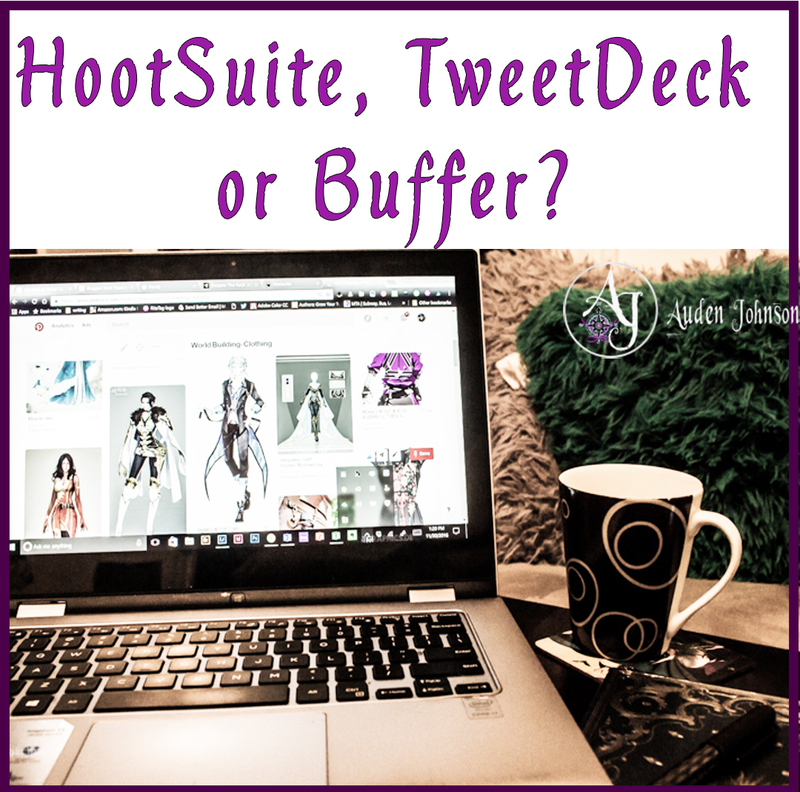 If you're only on Twitter, Tweetdeck or Buffer would be best. For Pinterst, Tailwind in the best. I prefer HootSuite because it's more robust. Which social media scheduling tool do you use?